Based on a true story, a struggling author called Lee Israel turns in desperation to a shady criminal career using her genuine writing talents to forge fake letters from literary greats, aided by her equally troubled friend and accomplice. The hopeless pair plunging ever deeper into inevitable trouble. Melissa McCarthy’s splendid and subtle lead performance has already earned her considerable well deserved awards recognition. She offers up a sincere portrait of a person struggling with bitter personal failures and the crushing weight of cruelly self-imposed isolation. 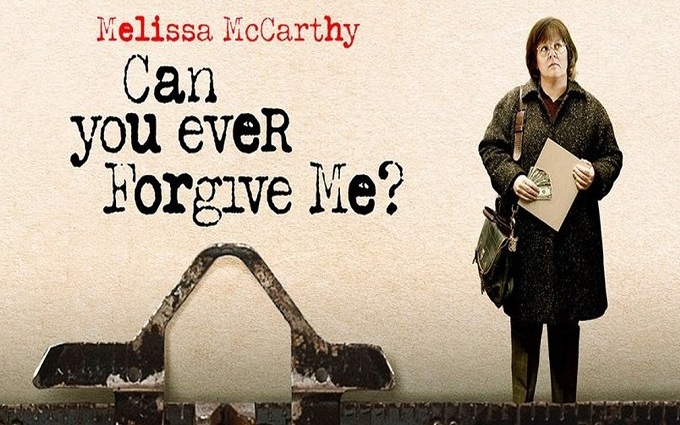 McCarthy displays a fragile vulnerability and emotional depth far beyond the lazy clichés and silly slapstick that have increasingly defined the diminishing returns of her oversaturated comedic work. Flexing her dramatic muscles she shows a considerable gift for crafting a character who is equally obnoxious and sympathetic. With a less thoughtful and authentic performance this character could so easily have been just a tragic ‘old cat lady’ stereotype. Instead McCarthy breaths humanity and sincere aguish into a layered performance of a woman longing so clearly for companionship and recognition in a world that seems to offer little of both. McCarthy’s flashes of wit and anger makes things more enjoyable than merely watching someone wallow in unrelenting self-pity. Alongside McCarthy’s star turn, Richard E. Grant provides a perfect embodiment of her flamboyant and flawed partner in crime, Jack Hock. Grant channels all his well-practised flare for playing hedonistic grifters into a career defining performance. Grant’s character is a cheerily shambolic mess and a wonderful accompaniment for McCarthy’s more maudlin moments. Between them the pair strikes a compelling balance between true despondency and endearingly uninhibited desperation. A pleasant soundtrack and equally pleasing cinematography soothes some of the film’s sadder themes and injects just a hint of whimsy and romantic optimism to proceedings. Overall combined with terrific performances the film is both compelling and unconventionally charming. It’s a nuanced New York drama that most notably echoes some of Woody Allen’s acclaimed early work. Those expecting to see yet another heavy handed slapstick comedy built around McCarthy’s loud mouthed foolishness will undoubtedly be a little disappointed by a film far more meditative and melancholy than that. It would be a mistake to watch this film expecting to see the kind of comedy that made McCarthy a household name in films like Bridesmaids, The Heat or the atrocious Ghostbusters reboot. It’s only fair to acknowledge that while this film is arguably a major improvement on some of McCarthy’s less credible comedic efforts, it’s not necessarily going to satisfy those who have come to reliably rely on her merely for low brow laughter. For those fans at least, this film may prove a little too slow paced and miserable for their tastes. Can You Ever Forgive Me? treads a fine line between comedy and tragedy, guided by two sensational performances from Richard E. Grant and Melissa McCarthy. It will redefine audience’s expectations of McCarthy and provides an enjoyably sordid ride.